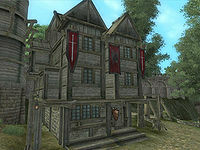 Bravil Fighters Guild is on the east side of the main island, between the bridge to Castle Bravil and The Fair Deal. 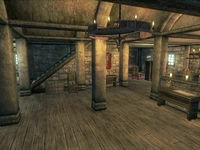 The ground, second, third, and basement floors are divided into Fighters Guild, Bravil Fighters Guild 2nd Floor, Bravil Fighters Guild 3rd Floor, and Bravil Fighters Guild Basement. Upon entering the building, a bookshelf to the left holds a copy of The Old Ways. Around the corner, a rack holds two iron daggers and one iron longsword. Nahsi, Tadrose Helas, Vincent Galien and a Fighters Guild Porter may be found in this main entrance. Farther around to the left, past the stairs up to the second floor, a steel dagger sits on top of a desk. A chest below the Fighters Guild banner holds clutter, as does the one behind the desk. Another steel dagger sits on the bookshelf, and the cupboard next to it contains clothing. All of these containers respawn. Next to the stairs is a chest with up to three leveled pieces of equipment. The area to the right of the main entrance has a large round dining table with five chairs. On the table are two loaves of bread, nine blackberries, grapes, an orange, a cheese wedge, a head of lettuce, a bottle of cheap wine, and a bottle of Tamika's West Weald wine. The chest behind the table contains only clutter, but the cupboard next to it contains beef, bread, a cheese wedge, and a carrot. Two cupboards sit back-to-back in the middle of the room; the one facing west holds dishes, and the one facing east holds clutter. The locked display case in the southeastern corner showcases a glass ceremonial cuirass and a similar set of gauntlets and a shield. On the rack here is an iron claymore and a warhammer. The two barrels in the east corner contain clutter and/or a repair hammer. The door next to these barrels leads to the Basement. All of the containers here respawn. The door from the first floor opens next to a set of stairs leading up to the third floor. At the foot of these stairs, three crates and two barrels each contain clutter and/or a repair hammer. The three tied sacks contain clutter, and the untied sack contains food. The sacks do not respawn, but the crates and barrels do. To the right of the entrance is a long hallway with two doors on the left wall and one at the far end of the right wall. Opposite the last door is a small alcove with three crates and a chest, each containing clutter and/or a repair hammer, and two barrels that each contain food. All of these containers respawn. 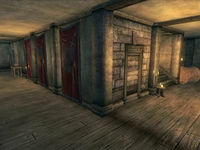 The first door on the left in the hall reveals a small bedroom with a double bed available for Fighters Guild members. The table next to it holds two loaves of bread, a head of lettuce, and a cheese wedge. The respawning cupboard next to the door contains clothing, and on top of it sits a Nirnroot. The second door on the left in the hall reveals another bedroom with a double bed. The chest of drawers next to it holds clutter, and a scroll of Absorb Strength sits on top. Two leeks sit on the table in the corner, and the bookshelf next to it holds three tobacco leaves and two pumpkins, and three apples in the basket on top. The desk in the other corner holds clutter and/or a common book. The door at the end of the hall leads to a large room with a single bed in the east corner. A steel dagger sits on the bookshelf next to the door. The table in the middle holds a loaf of bread, three heads of lettuce, and four carrots. The door on the southeast wall leads to a small storage room. The two crates and the barrel each contain clutter and/or a repair hammer, and the chest can contain armor and/or a weapon. The two chests of drawers contain clothing. 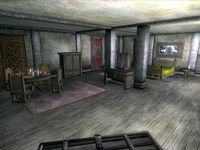 The two sacks also contain clutter, and unlike the other containers in this room, they do not respawn. The third floor is a single large room with a double bed at the far end. Two sacks containing clutter sit on a bookshelf in the eastern corner, and a crate in the northern corner contains clutter and/or a repair hammer. The chest of drawers in the middle of the room contains clothing, as does the cupboard on the northwest wall. The cupboard in the west corner contains food, and on the table in front of it sits four ears of corn, two tomatoes, and three radishes. The chest of drawers in the south corner contains clothing, and the chest on top of it contains gold and a possibility of jewelry and/or clutter. This chest does not respawn, nor do the two clutter sacks next to it; however, every other container in this room does. The door to the Basement reveals a set of stairs leading down. At the foot of the stairs, a cupboard contains clothing. 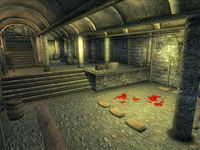 Next to the stairs, two weapons racks hold three iron warhammers and two iron claymores. The barrel next to the weapons rack contains clutter and/or a repair hammer, and the sack on top of it contains clutter. The two crates in the south corner also contain clutter and/or a repair hammer, as do the two barrels on the southwest wall. The cupboard in the east corner contains only clutter. Two tables sit side-by-side on the northeast wall; the one on the left holds two iron maces and an iron shortsword, and the one on the right holds two iron longswords and an iron dagger. A crate and a barrel between the pillars also hold clutter and/or a repair hammer, and the four sacks here also contain clutter. The sacks in this area do not respawn, but the rest of the containers in this area do. Two chests sit on the ledge between the raised area and the sparring area. The one closest to the steps contains weapons and/or armor and does not respawn. The other contains clutter and does respawn. The barrel next to the steps contains clutter and/or a repair hammer, as does the barrel in the north corner. Esta página foi modificada pela última vez à(s) 17h10min de 17 de março de 2014.